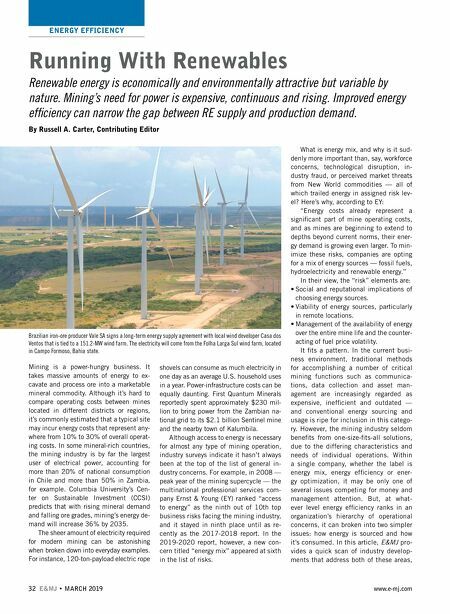 ENERGY EFFICIENCY 32 E&MJ • MARCH 2019 www.e-mj.com Mining is a power-hungry business. It takes massive amounts of energy to ex- cavate and process ore into a marketable mineral commodity. Although it's hard to compare operating costs between mines located in different districts or regions, it's commonly estimated that a typical site may incur energy costs that represent any- where from 10% to 30% of overall operat- ing costs. In some mineral-rich countries, the mining industry is by far the largest user of electrical power, accounting for more than 20% of national consumption in Chile and more than 50% in Zambia, for example. Columbia University's Cen- ter on Sustainable Investment (CCSI) predicts that with rising mineral demand and falling ore grades, mining's energy de- mand will increase 36% by 2035. The sheer amount of electricity required for modern mining can be astonishing when broken down into everyday examples. For instance, 120-ton-payload electric rope shovels can consume as much electricity in one day as an average U.S. household uses in a year. Power-infrastructure costs can be equally daunting. First Quantum Minerals reportedly spent approximately $230 mil- lion to bring power from the Zambian na- tional grid to its $2.1 billion Sentinel mine and the nearby town of Kalumbila. Although access to energy is necessary for almost any type of mining operation, industry surveys indicate it hasn't always been at the top of the list of general in- dustry concerns. For example, in 2008 — peak year of the mining supercycle — the multinational professional services com- pany Ernst & Young (EY) ranked "access to energy" as the ninth out of 10th top business risks facing the mining industry, and it stayed in ninth place until as re- cently as the 2017-2018 report. In the 2019-2020 report, however, a new con- cern titled "energy mix" appeared at sixth in the list of risks. What is energy mix, and why is it sud- denly more important than, say, workforce concerns, technological disruption, in- dustry fraud, or perceived market threats from New World commodities — all of which trailed energy in assigned risk lev- el? Here's why, according to EY: "Energy costs already represent a significant part of mine operating costs, and as mines are beginning to extend to depths beyond current norms, their ener- gy demand is growing even larger. To min- imize these risks, companies are opting for a mix of energy sources — fossil fuels, hydroelectricity and renewable energy." In their view, the "risk" elements are: • Social and reputational implications of choosing energy sources. • Viability of energy sources, particularly in remote locations. • Management of the availability of energy over the entire mine life and the counter- acting of fuel price volatility. It fits a pattern. In the current busi- ness environment, traditional methods for accomplishing a number of critical mining functions such as communica- tions, data collection and asset man- agement are increasingly regarded as expensive, inefficient and outdated — and conventional energy sourcing and usage is ripe for inclusion in this catego- ry. However, the mining industry seldom benefits from one-size-fits-all solutions, due to the differing characteristics and needs of individual operations. Within a single company, whether the label is energy mix, energy efficiency or ener- gy optimization, it may be only one of several issues competing for money and management attention. But, at what- ever level energy efficiency ranks in an organization's hierarchy of operational concerns, it can broken into two simpler issues: how energy is sourced and how it's consumed. 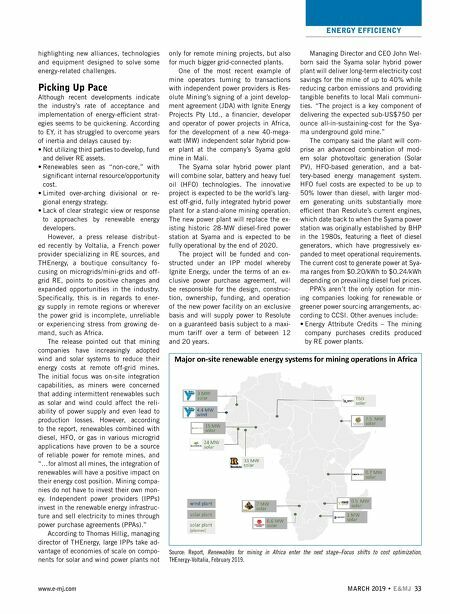 In this article, E&MJ pro- vides a quick scan of industry develop- ments that address both of these areas, Running With Renewables Renewable energy is economically and environmentally attractive but variable by nature. Mining's need for power is expensive, continuous and rising. Improved energy efficiency can narrow the gap between RE supply and production demand. By Russell A. Carter, Contributing Editor Brazilian iron-ore producer Vale SA signs a long-term energy supply agreement with local wind developer Casa dos Ventos that is tied to a 151.2-MW wind farm. The electricity will come from the Folha Larga Sul wind farm, located in Campo Formoso, Bahia state.